This hearty chicken soup with a Mexican twist is loaded with chicken, carrots, potatoes, tomatoes and zucchini. It is a crowd-pleaser at restaurants that are part of the popular El Torito chain throughout California. To save time, you can use a cooked rotisserie chicken, usually in the deli or meals-to-go department at the grocery store, or your own leftover chicken. In a large pot, combine the chicken broth, onion, carrots, celery, bell pepper, potatoes, tomato paste, bay leaf, garlic and oregano. Season to taste and bring to boil. Simmer 25 minutes. Add zucchini, tomatoes and shredded chicken breast pieces. Bring the mixture to a boil, then simmer 10 minutes. Remove from heat. Cut the tortillas into matchstick-size strips. Sauté in hot oil until crisp. Drain on paper towels and set aside. To serve, place tortilla strips in individual bowls. Cover with shredded Jack cheese and ladle in the soup. Top with a slice of avocado and a cilantro sprig. If you're serving El Torito's tortilla soup as a main course, serve warmed corn or flour tortillas as a side, along with slices of Monterey Jack cheese for nibbling. If you feel ambitious, serve chicken flautas on the side. 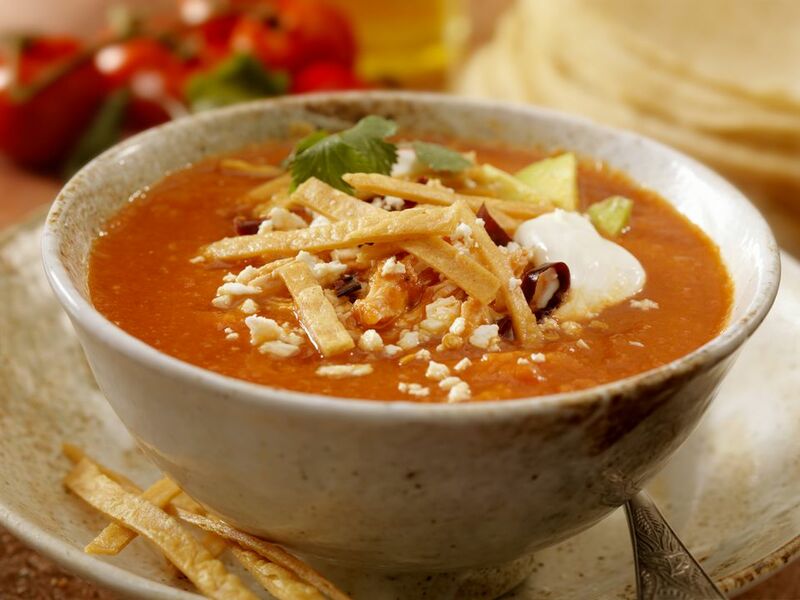 If you're serving tortilla soup as a first course, follow with cheese enchiladas with red sauce, chicken enchiladas with green sauce, loaded chicken tacos, refried bean tostadas, chicken fajitas or chiles rellenos. You can't have Mexican food without the right cocktail. Serve margaritas, salt or not, and if you feel like upping the volume, make it with gold tequila and top it off with a bit of Grand Mariner. Now there's a real Mexican cocktail. If it's hot, think frozen daiquiris. Or serve ice cold bottles of Corona or Dos Equis if beer's more your thing. For a grand finale, make authentic Mexican sopapillas with cinnamon and honey – a la mode makes them extra good.